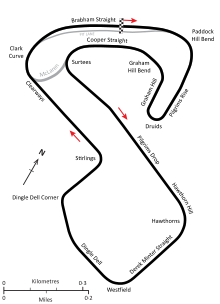 The XII Race of Champions was a non-championship Formula One race held at Brands Hatch on 20 March 1977. John Watson qualified on pole, while James Hunt set fastest lap and won. Darren Galpin. "1977 Non-World Championship Formula One Races". silhouet.com. Retrieved 18 November 2015. "Formula 1 1977 - Brands Hatch, 20.03". formula2.net. Retrieved 18 November 2015.